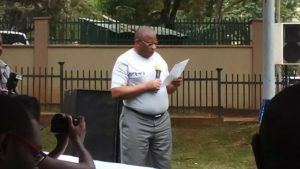 Chairperson of the Uganda Human Rights Commission Meddie Kaggwa speaking at CHOGM Grounds in Kampala after the procession. Courtesy photo. Despite international and local legal instruments prohibiting torture the vice still continues. This year the Uganda Police Force came under heavy criticism following alleged incidents of torture of the suspects arrested in connection with the killing of the former Assistant Inspector General of Police, Andrew Felix Kaweesi alongside his driver and body guard. The suspects include Kamwenge mayor Godfrey Byamukama. A human rights activist displays a banner with the day’s theme. The suspects complained to the Nakawa Chief Magistrates court about being tortured both physically and psychologically as well as being starved while in detention.The Coalition Against Torture led by the African Center for Treatment and Rehabilitation of Torture Victims (ACTV) with support from the Democratic Governance Facility (DGF) this year carried a series of events to commemorate the day. 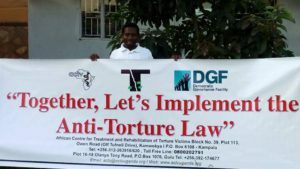 The events included among others, a public debate on the June 20 at the Imperial Royale Hotel where the organizers called upon government to implement the law against torture. 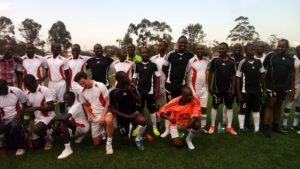 The organizers also held public dialogues with residents of Nakawa market, Kampala and in Kitgum on June 21 and also organized a football match between the organizers and the media. The media team poses with a team of the organizers before the friendly game. The team also held a peaceful procession in Kampala today graced by the chairperson of the Human Rights Committee in Parliament , Hon Jovah Kamateeka (Woman MP for Mitooma District) , Chairperson of Uganda Human Rights Commission Mr Medi Kaggwa and representatives from the Democratic Governance Facility. They all urged the government of Uganda to work towards eliminating torture in all its forms in Uganda.